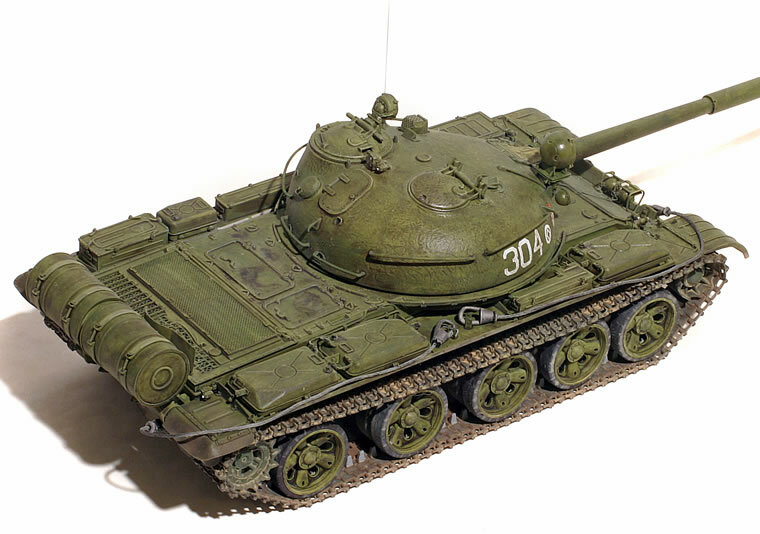 Trumpeter's T-62 is a much awaited replacement for the ancient and awful Tamiya T-62. The Trumpeter kit is pretty much up to their current standards, meaning that it is a world better than the old Tamiya kit, but still not entirely A-list. 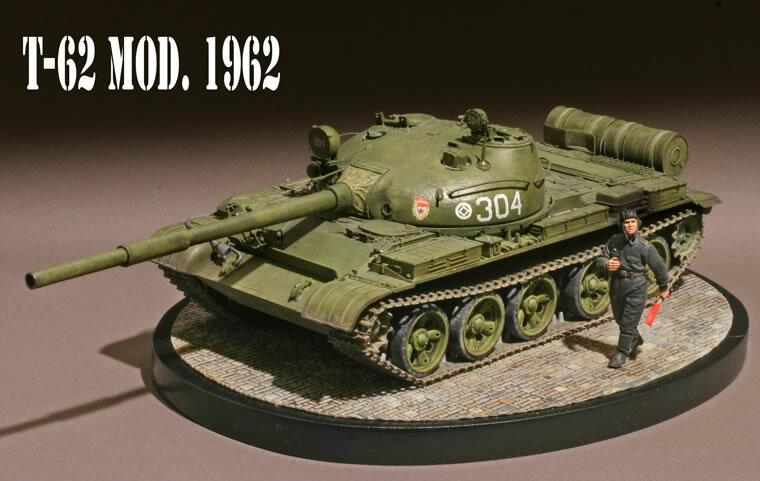 Although the kit is basically sound, it falls down on the small detail compared to other recent Soviet Cold War types like the Tamiya's excellent T-55. Overall, I would rate it a B+. 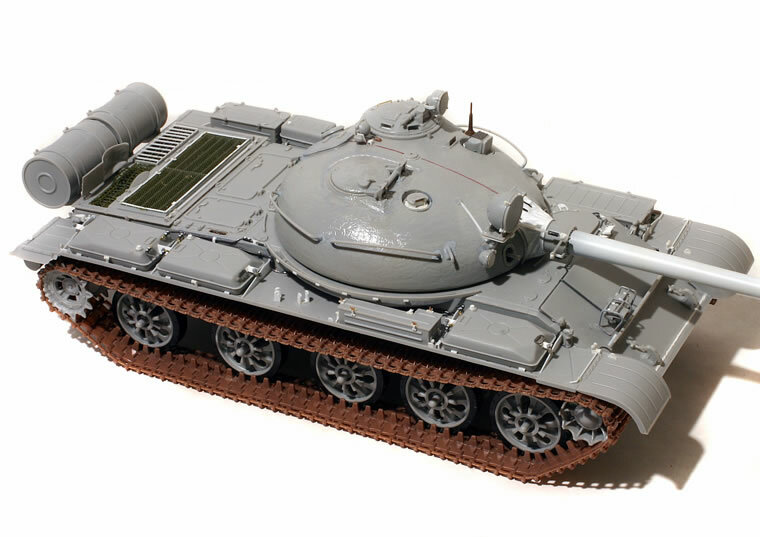 The kit appears to be the first of several T-62 kits from Trumpeter. 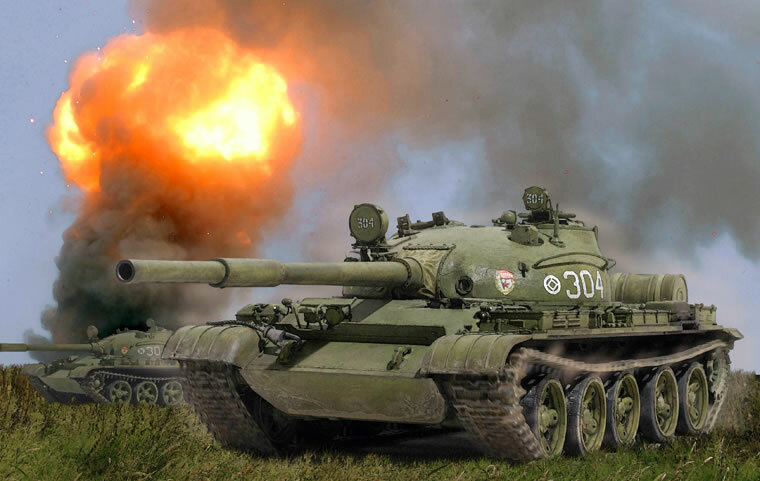 The parts breakdown will allow Trumpeter to spin off the T-62 Model 1967 (same turret, upgraded engine deck) and the T-62 Model 1972 (new turret with DShK-M machine gun mount) to say nothing of the later re-builds. The kit is state-of-the-art in terms of content: basic kit in plastic, plus a small PE fret, turned aluminum gun barrel, soft copper tow cable; clear plastic lights and periscopes. One interesting innovation is the separation of the tires from the wheels, which makes painting easier. Overall, good value for money with all the tasty extras. The kit has a number of issues, both major and minor. Two structural issues discussed on Missing Lynx already are the rear plate which should join the engine deck at a 90 degree angle, and the loader's hatch which should be perpendicular to the centerline. Neither of these issues is particularly noticeable on the finished model, and I suspect that most modelers will ignore them. I re-oriented the loader's hatch, but skipped dealing with the back plate. There are a host of small detail issues, many of which have been hashed out on Missing Lynx in the Modern Forum. The fuel tanks on the left side have some detail issues including the usual lack of hosing as well as the configuration of handles. The aluminum gun barrel is nice but the bore is bit small and the final collar is a bit prominent. The depictions of the two rear engine deck openings are simplified. The turret casting effect isn't the best. Many of the small attachments for the fender boxes are simplified. None of these are show-stoppers, and the kit will build up extremely nicely out of the box. I suspect that we will see some after-market items to address some of the issues. Overall, I was very pleased with this model and builds up into something much closer to reality than the old Tamiya kit. More details in a forthcoming article in Military Modelling.